Put Vocal Processing and Looping at Your Fingertips! 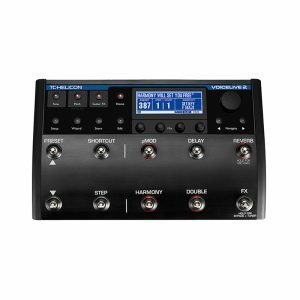 The TC-Helicon VoiceLive Touch 2 takes singers out of the world of stompbox-style control and gives you a new level of hands-on performance possibilities. After all, since you’ve got your hands free to grab the mic when you want to, why rely on pedal-only effects? Get your fingertips on the VoiceLive Touch 2 and take charge of harmonies, effects, and even looping. The intuitive display screen puts you in touch with all the controls you need. You can easily navigate through 200+ presets to find the perfect sound. And you can also store your favorite combinations/edited presets to 25 fast-access memory locations. TC Helicon Voice Live 2 , Professional Vocal Multi Efx.